One Direction's new album FOUR has debuted at number on the Billboard 200 chart this week. - They are the fourth act, overall, to have their first four studio albums debut at No. 1. They follow soloists Britney Spears (between 1999 and 2003), DMX (his first five, 1998-2003) and Beyonce (five, 2003-2013). - FOUR tallies the biggest week for an album by a group since One Direction’s previous effort, Midnight Memories, started with 546,000 on the Dec. 14, 2013-dated Billboard 200 chart (reflecting the sales week ending Dec. 1). - FOUR is One Direction’s fourth No. 1 album in a row, in less than three years. 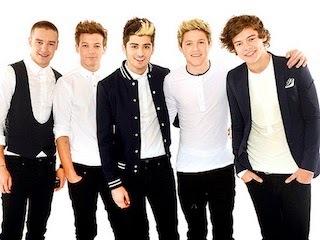 They previously topped the list with their debut effort, Up All Night (on the list dated March 31, 2012), Take Me Home (Dec. 1, 2012) and Midnight Memories.